Farkle is a fun and challenging dice game with multiple variations and scoring options. To score a minimum of 10,000 points. You can buy boxed versions of the game! 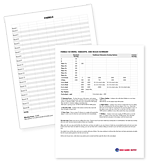 We we also provide a free printable Farkle score sheet and scoring and rules summary. These are the most commonly used Farkle rules, but there are many variations (see Variations below). Before the game begins, players should establish which rules or variations will be used. Our scoring summary chart makes this process easy and provides for endless variety in your Farkle games! One player is chosen to begin and play moves clockwise around the table. Each player in turn rolls all six dice and checks to see if they have rolled any scoring dice or combinations. (See Scoring below.) Any dice that score may be set aside and then the player may choose to roll all the remaining dice. The player must set aside at least one scoring die of their choice if possible but is not required to set aside all scoring dice. For example, if a player rolled 1-2-2-5-5-6 on their turn, they could set aside the 1 and the two 5's for scoring, or they could choose to set aside only the 1. Any scoring dice that are not set aside may be rerolled along with the non-scoring dice. If all six dice have been set aside for scoring (known as having “hot dice”), the player can choose to roll all six dice again and continue adding to their accumulated score or they can bank their points, end their turn, and pass the dice to the next player. A player’s turn continues until either they decide to stop and score their accumulated points or until they fail to roll any scoring dice on a throw. If a player scores no points on a roll, this is known as a Farkle. The player may continue to roll any dice that have not been previously set aside for scoring, but all of their points gained so far that turn are lost. At the end of a player’s turn, any points they have scored are written down and the dice are passed to the next player. The first player to score a total of 10,000 or more points wins, provided that no other players with a remaining turn can exceed that score. These scoring variations can be used in combination with, or in place of, the basic scoring scheme above. The basic scoring, along with all these variants, are conveniently listed on our free Farkle score sheets and scoring and rules summary. When the game begins, each player must continue throwing the dice until they have scored at least 500 points or until they Farkle. Once they have reached the 500 points, they are free to continue rolling or end their turn. Opening scores of 350, 400, 600, or 1000 points may be used instead of 500. A player who scores on all six dice must roll them all again at least once. A player who rolls three Farkles in a row loses 1000 points. Four or more 2’s thrown in a single roll cancels the player’s entire score for that turn and ends their turn immediately. A player may choose to begin their turn by rolling the dice remaining from the previous player’s turn (e.g., those dice that were not set aside for scoring from the previous player’s turn). If the player scores with any of the dice on the first roll, they receive 1000 points in addition to any other points they may accumulate. A player must score exactly 10,000 points to win the game. If a player scores more than 10,000 points, then all points scored that turn are given to the player with the lowest score. The game is played in teams. Teammates sit opposite each other at the table and combine their scores. The game is typically played to 20,000 points instead of 10,000.